Chinese authorities often hire criminals or outsiders to help with its dirty work of land grabbing. When things went wrong in one such case in Fujian, they ended up putting innocent people in prison. Bitter Winter has recently uncovered evidence, including documents and audio recordings, as per which, the authorities in Fujian made five Chinese youths take the fall for their wrongdoings in 2012. In May that year, the county authorities of Fujian’s Xianyou wanted to sell local farmland to developers at high prices and pocket the profits. When they couldn’t convince the villagers in their favor, they decided to grab the land forcibly with the help of the police and thugs. A criminal gang member Yang Fengjie persuaded five local young men – Fang Yongren, 22, Qiu Qibin, 19, and three 16-year-olds, Zheng Yu’nan, Huang Jian, and Zheng Dezhi – to join his group hired by the government to take over the land. They were promised 200 RMB or nearly 30 USD, along with a pack of cigarettes, for each day’s work; additional money was pledged after the land was occupied. Three days later, the 600-heavy contingent showed up in the village at 8 am and began to assault the protesting villagers. Their leader told the criminal gang members that the government would take responsibility for any mishap and so they should be as aggressive as they can be. According to an eyewitness account, 28-year-old Ruan Jianhang was passing through the village after completing his work at around 11:30 am. However, a gang member in his 40s mistook him for a protestor and ended up beating him to death. This led to outrage amongst the villagers, and to calm down the situation, the authorities began to hunt for the “murderer.” Hoping to use the criminal gangs in the future, the authorities left the actual culprit alone. Instead, as revealed by a government insider, it was decided that the five young men who were hired especially for this job would be implicated as Mr. Ruan’s murderers. Government officials soon convinced the five to take the fall, saying that it was a mere formality and they wouldn’t have to face jail or any punishment. 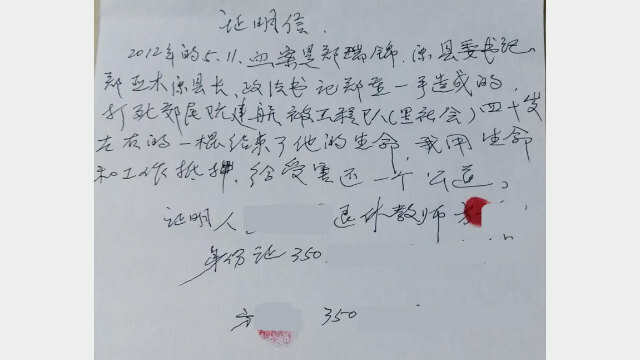 The gang leader sought out the families of the youths who were minors and promised 250,000 RMB (nearly 36,000 USD) in return for a false confession. Within two weeks of Mr. Ruan’s deaths, the police officers took the five youths to the spot where he was beaten and took photos of a false reconstruction of the crime. By June 22, the five were arrested. In November, the authorities also turned on the gang member, Yang Fengjie, and arrested him to cement the CCP’s image of being “just.” He was sentenced to seven years in prison. Next month, the court heard the trial of the five youths as well. The defendants first took a not-guilty stand, but after deliberations with government officials during recess, they decided to toe the line and “confess” to having beaten Mr. Ruan to death. The court sentenced both Mr. Fang and Mr. Qiu to ten years in prison. Of the minors, Mr. Zheng Yu’nan got four years in prison while the other two were sentenced to three years each. As minors, the three were allowed to serve their sentence over four years on probation. But since the officials had deceived them, they were shocked to realize that they would have to serve time for a crime they never even committed. The court, however, refused to entertain their grievances. Unwilling to tolerate such blatant injustice, their families filed an appeal against their sentencing. It was heard in March 2015 in Putian city, but the plea was dismissed, and the original sentence was held once again. The lawyer revealed that many human rights lawyers had been arrested in recent years and so, there is no way anyone would even dare to take on the case of these five young men.